This section is based on a recent research study conducted by Jae Hong Lee (2009) at University College London under the supervision of Ruth Conroy Dalton. 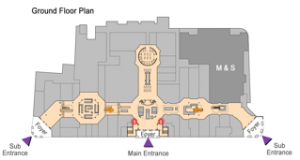 In this study, Lee analyzed the building layouts, observed user-behavior and conducted wayfinding and other spatial cognitive experiments in a sample of four, large-scale shopping malls situated in the Greater London area: Bluewater Shopping Centre, Brent Cross Shopping Centre, Westfield Shopping Centre and Whiteleys Shopping Centre. 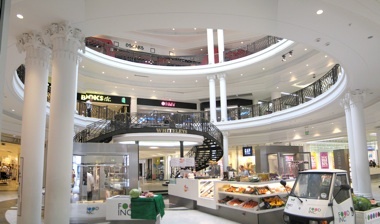 We profile the Whiteleys Shopping Centre here. For a more detailed description please refer to Lee, J., (2009), Spatial Properties and Meanings of Atria in Built Environment, unpublished masters thesis, University College London which is available from http://eprints.ucl.ac.uk/ UCL’s institutional, research repository. Whiteleys Shopping Centre , axial line analysis indicating integration values (most integrated lines of sight = red, most segregated lines of sigh = blue). What is interesting about this subset of answers, is the focus on straight and direct routes (arguably the cognitively simple ones), the use of other stores as wayfinding landmarks, and the frequency with with the atria feature in these route descriptions. The focus of this study was the role in which atria play in shopping centres. The conclusion being that, as well as being a primary point of vertical circulation, atria can serve a dual function as a sort of short-cut to survey knowledge, permitting views to and knowledge of floors other than the one which the shopper is currently situated. This type of ‘knowledge-enhancement’, becomes particularly advantageous when wayfinding in an unfamiliar environment. An awareness of this provides particular spatial affordances, specific to wayfinding in complex environments.